I wear the same clothes everyday, and so should you. I should clarify, I don’t wear the SAME EXACT clothes. Otherwise I would repel my co-workers or I would have to do nightly laundry. I wear the same color and style of clothing everyday. Basically, if I had to get dressed wearing a blindfold, I would leave the house looking very coordinated. Always wear at least 75% black clothing. That means if you put on black shoes, socks, underwear and pants, then you can wear any color shirt and still look good. Likewise, if you put on all black except for beige Khakis, you would still look stylist. Then about after a year, my closet starting looking monochromatic. Almost all my clothes were black except for a few white shirts. This transformation had a massive impact on my daily thought equity. Not having to think about the mundane task of what to wear for the day freed up my morning time. I know what you’re thinking, “How long does it really take to pick out clothes?” As a creative professional, there are only so many minutes in a single day to generate quality thoughts. Saving a few minutes of decision making frees my brain up for creative ideation. I can move autonomously though the morning routine without any useless decisions. I then realized that other high-profile people also subscribe to this methodology. 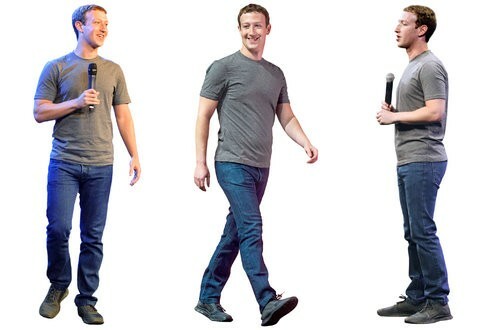 People such as Steve Jobs and Mark Zuckerburg wear the same exact style clothing almost every day. Steve Jobs branded his image. The other thing about wearing the same clothes, it brands your image. Sure, at first people may think you are just lazy. But after a few months, people actually become trained to recognized your style. I tested this theory by wearing a pair of blue jeans one day. My wife said, “what are you wearing?” as if I were going to work in a unitard. My kids laughed and said, “you look funny!”. People at my work teased me and asked if I was going mental. I found that people like consistency and predictability in their friends and family both in personality and in appearance. I realize that guys can get away with this fashion statement better than women. It’s not a lifestyle that everyone can adapt to. I suggest you try it for a month and post your experiment results below. Founder of @Lifeblinkinc, Hero Network, Wish Upon A Hero Foundation. Branding Expert. Serial Entrepreneur. Keynote Speaker. Personal Historian.